Seriously fruity nibbles, crammed with raspberries, dates and raisins for a really sweet and satisfying taste. 100% natural ingredients. Perfect to share or even nibble by yourself. 100% natural ingredients without any kind of artificial flavourings, extra sugars or preservatives. 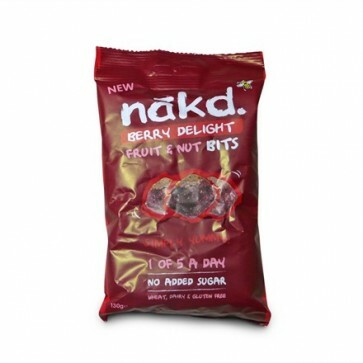 INGREDIENTS: Dates 49%, cashews 31%, Raisins 17%, Raspberries 3%, rice flour & a hint of natural berry flavouring. May contain traces of peanuts, other nuts and the odd shell or pit piece. Gluten, wheat and dairy free. No added sugar.